"I remember writing My Name is Joe and what often happens when you're writing a script is a lot of characters try and claim attention, and they say 'Me, me, me! You must tell my story!' And there was a couple of rowdy teenagers who demanded attention and one who, in my mind, is now Liam." 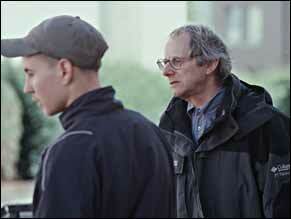 From the late 1990s Ken Loach would increasingly choose to set his films in Scotland. This partly followed from his new collaboration with Glaswegian writer Paul Laverty, but also reflected the growing availability of public funding north of the border. After Carla's Song (1996) and My Name is Joe (1998), the ironically titled Sweet Sixteen (2002) became the third film in Loach and Laverty's informal Scottish trilogy. Set in and around Greenock, a former shipbuilding town on the Clyde, the film follows the highs and lows of Liam, a teenager on the brink of his 16th birthday and of some serious, life-changing choices. The disused shipyards of Clydeside loom large in the background of Sweet Sixteen , reminding us that here is a place offering few or no economic opportunities for its young people - or, indeed, many of its older generation, who find themselves redundant, in prison, on drugs, or leading lives of crime. It's this environment that motivates Liam's struggle to improve himself and the life of his family through his high-spirited, enterprising schemes, and that gives Sweet Sixteen its emotional punch. Ultimately, Liam's determination leads to his tragic downfall; at the film's end his future seeming even more bleak and uncertain. This tour takes you behind the scenes of the making of Sweet Sixteen . We talk to Ken Loach and Martin Compston (Liam), as well as other key members of the crew about their experiences and working methods on the film. The videos follow the film from its conception to its cinema release, ending by exploring the its political subtext and the controversy surrounding its 18 classification. This tour is intended to complement another tour exploring Loach's 1965 television drama 'Up the Junction' and the BBC's groundbreaking Wednesday Play . Both tours also include teaching resources for older students (follow the education links at the side of each page to see how you can start applying some of the material highlighted in each section). Teachers please note: Sweet Sixteen contains some very strong language, and the clips used in this selection of short films are not always appropriate for some students. Please ensure that you watch the films through before using them in the classroom. Find your way around the tour using the tabs at the top of the page.